Cookie: Merely saying or writing the word instantly conjures up pleasing thoughts of chewy goodness. One can never go wrong with set of freshly baked cookies, which is why the team behind the CHiP wants to bring it to kitchens everywhere. 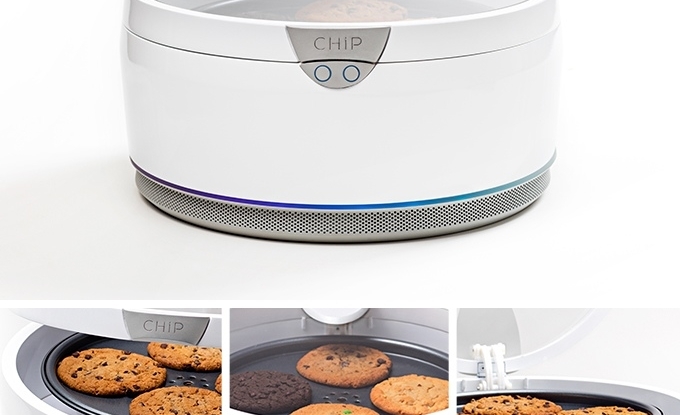 The CHiP smart cookie oven does one thing and one thing well: Perfectly bake cookies in under 10 minutes. It does this with its QuickConvect Air Flow System that uses a four-inch convection fan to blow hot air through special air channels, not only ensuring the tastiest cookies but also energy efficiency in baking them. Now by itself, this would make the CHiP no better than a standard oven, especially since it only can bake cookies. But combined with its companion app, users can set various baking modes sporting varying schedules and, more crucially, order ‘cookie pods’ similar to the coffee capsules used by products from companies like Nespresso. (With the explicit assurance that each is packaged in an environmentally-friendly way, of course.) Users can buy cookie pods in a variety of flavors for all types of diets (from paleo and gluten-free cookies to the more indulgent kind like Triple Chocolate Explosion) a la carte or opt for monthly deliveries to avoid the hassle of whipping up dough from scratch. $99 gets cookie lovers their own CHiP, which is $150 off its eventual retail price. Should its Kickstarter campaign raise $100,000 by December 2nd, 2016, the CHiP should arrive on doorsteps by October 2017. While the CHiP is quite a novelty, it’s excessive and a tad unnecessary. At the end of the day, heading out and purchasing a solid toaster oven that bakes cookies along with reheats, toasts, and cooks a variety of other foods seems like a better investment. While the product itself is charming what with its LED lights and silly noises, it’s obvious that it’s a play at monetizing something that doesn’t need to be, as the tedium involved with baking cookies from scratch is overblown. And with far more versatile smart cooking products like the June smart oven out there, it’s hard for the CHiP to stand out.